Analysis: Khyri Thornton was a bit of a surprise pick this early in the draft, as most draft experts had him closer to a 5th round selection. At 6’3” 304, Thornton seems best suited for playing the 5 technique in the Packers 3-4 defensive Scheme. He may not make an instant impact this season, but he has some upside and could play a role in the Packers defensive line rotation. 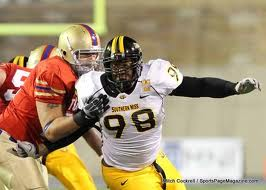 Thornton was a 3 year starter at Southern Mississippi and had 116 tackles, 30 tackles for a loss, 5.5 sacks and 2 forced fumbles. Thornton has a good strength and should be able to hold up well against double teams and could be a force against the run. How does he fit with the Packers? Thornton will be part of a very strong Packers defensive line rotation. He was the lone bright spot for a very bad Southern Miss team last year. Defensive line coach Mike Trgovac will try to get the most out of him as a player. The hope here has to be that Thornton will be a better pro than he was in college. If he really does turn out to be CJ Wilson this has to be a disappointing pick for the fan base. I’m going to go ahead and concede to Ted Thompson, though his ability to draft defensive linemen is questionable. Thornton is similar the the ex-Packer Wilson in that he is mainly a run stuffing defensive end. He only had 1/2 sack last year at Southern Miss. Thornton certainly looks the part at 6’3″ and 304 pounds. His best quality is to get off the ball quickly to penetrate and make plays in the backfield. However, if Thornton doesn’t shoot the gap quickly he will have trouble beating his man. PackersTalk.com writers Ross Uglem, Ian Hanley and Matt Bove contributed to this article. This entry was posted in Packers 2014 - 2015 Season and tagged 3rd Round, Khryi Thornton. Bookmark the permalink. Ted has a mold unless those with interest did not know this. All his O linemen are the same height and the same weight. All his run stuffers are close to the same weight and height. Ted for some reason has a mold in mine and picks his picks in advance based on that mold. I agree his problem is the best D linemen are in the early draft and he is just throwing darts at balloons trying to get playmakers after that point. Why we need NT when teams are passing 75% of the time is beyond me. Taller, faster, more athletic guys can move to the ball and pass rush. Guys like this are asked to just fill a hole and that is a waste of time. Teams ran left and right with great success against the Packers neutralizing the BJ Raji’s of the world.